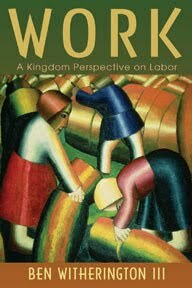 The Blog of Dr. T. Michael W. Halcomb: Witherington's "Work: A Kingdom Perspective On Labor"
Witherington's "Work: A Kingdom Perspective On Labor"
My doctoral supervisor, Dr. Ben Witherington, III, just gave me a copy of his new book, Work: A Kingdom Perspective on Labor. This is the first book in a series, on the cycles of life (e.g. work, rest, etc.) and looks to be a good little book with down-to-earth stories, good humor and sound theology. I look forward to getting into this text and have heard from a couple of friends already that it’s quite a good read! Review Of Willimon's "Why Jesus?"